As he talked about specific poems he made the following general points. •	The subject matter has to work literally as well as figuratively. •	Might the writer need to pay more attention to form? •	Is that form appropriate to the poem? •	Does the page need to be filled? Shortness, simplicity and truth can be just as effective. Don’t be afraid to cut. •	Is the concept suitable for poetry? •	1st Place – Susan Perkins with ‘Gerunds’, a poetic reflection on communication. Due to an oversight the trophy was not available for presentation, but Nasser was photographed congratulating Susan on her win. The winning entries were then read. Susan prefaced her reading with an explanation of how the poem came to be written. In Elizabeth’s absence, Nasser read on her behalf. 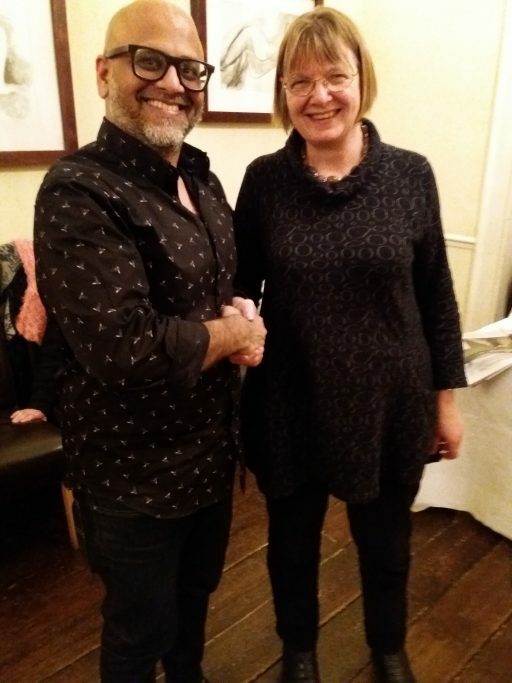 Susan thanked Nasser for his adjudication. 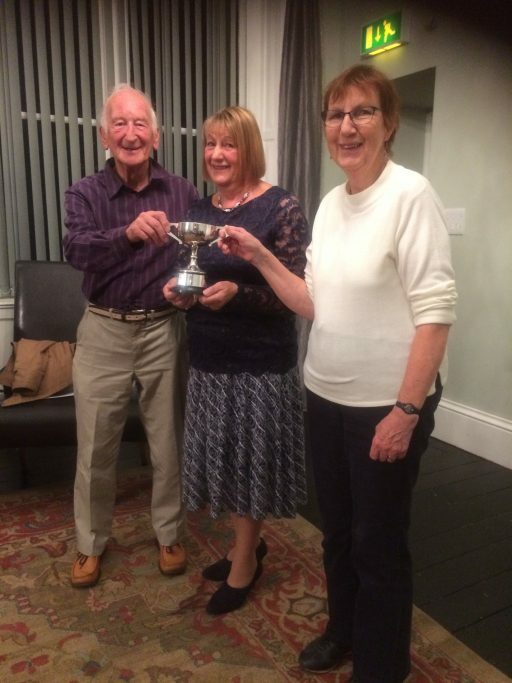 Unable to be present at the adjudication of the 2017 Mini-Saga adjudication (see below), Maggie was delighted to receive the trophy from Phil this evening. Jill Freeman began by explaining that she was there because the Competition trophy had been donated by her mother. Unlike many in her family she was not a writer herself but more of a story teller in the oral tradition. She went on to detail what she was looking for in her adjudication, concluding by summarising her thoughts in a mini saga of her own. In Maggie’s absence Jill was unable to present the trophy but a suitable picture of her with the runners up was taken for the website. Jill then rounded off her adjudication by telling the story of a short story competition she tried to enter but was thwarted by not putting enough postage on the envelope. Sheila expressed the Group’s thanks to Jill for her adjudication. 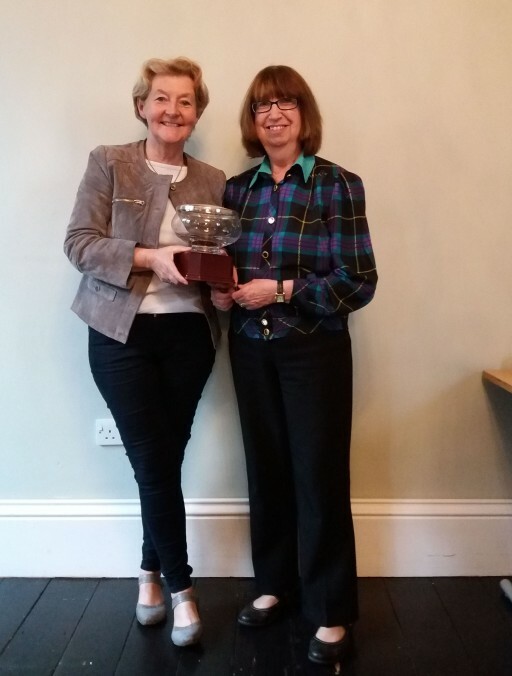 Sheila introduced adjudicator Janet Gleeson, explaining that Janet had had a career in journalism, working mainly as a news journalist in the North East and Yorkshire. 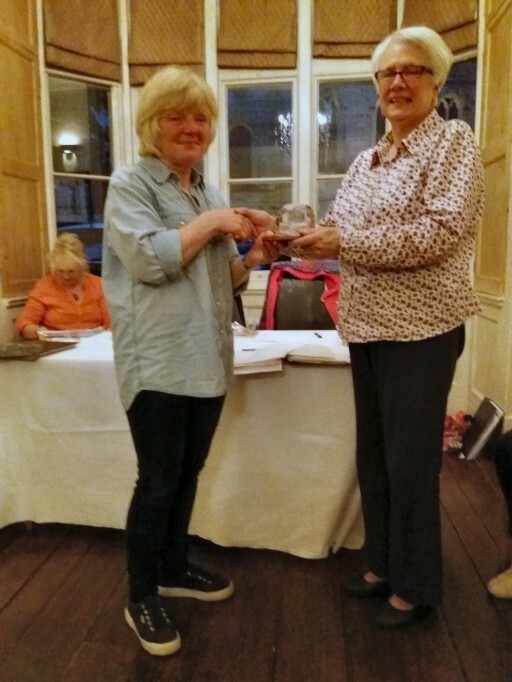 Janet began by saying that, having read the entries, she was pleased to have accepted the invitation to adjudicate this competition. She then confirmed some details of her adult life as a news journalist. Turning to the competition entries she said that she had been looking for something that was an interesting read, that kept the interest going throughout and which held her attention from start to finish. She said that she liked to find passion in the writing. In her own writing she liked to include quotations and suggested that this was something that all writers should consider. Following her general introduction Janet gave her comments on each of the individual entries. •	Getting all the material down quickly before thinking about polishing it. There was time before the break for Janet to talk about the way the newspaper industry had changed during her lifetime. She compared her own good fortune – being offered four jobs on completion of her journalism course at Darlington College – with the pressures that face newcomers today. Better late than never! Lindsay received her trophy (see below) from Sheila. 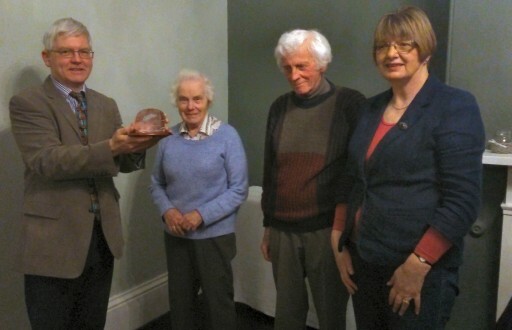 Unfortunately, Lindsay Trenholme wasn’t present this evening to receive the trophy for her winning story, Openings. 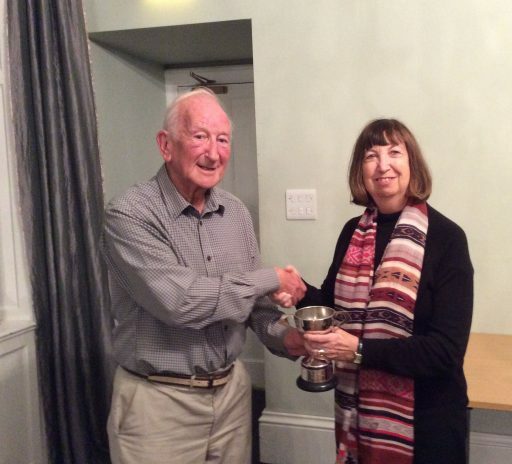 Adjudicator Gary Booth is pictured here with Susan Perkins, who came second. Also in the photograph and in joint third place are Janet Barclay with Sunday Treat and Joe Peters with Into A New World. 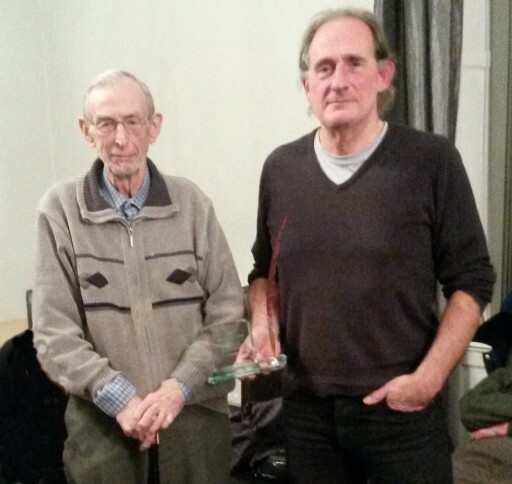 In welcoming Gary, Sheila recalled the helpful and encouraging comments he had made the last time he adjudicated for us, particularly about the importance for a writer immediately to capture the interest of the reader. On this occasion, Gary began by saying that currently his main private reading was of non-fiction, but in the past he had enjoyed many short stories and was glad to immerse himself in them again, even though nowadays they had become the Cinderella of fiction. He had had to ask himself: What is a short story? What makes a good one? Besides the more mechanical elements of punctuation and the structure of sentences and paragraphs, important features usually involved the inclusion of only a small number of characters; some dialogue; the setting; and the knowledge that something will happen, so that the story builds up to its ending. A “moment of change” was often regarded as vital. However, it was perfectly possible for good stories to lack some of those features, provided the writer found the right mix for the particular subject matter and achieved the right tone for the story overall and made the reader want to read it. Success could be achieved by exploring and revealing human nature or illuminating something ordinary in a different way. Gary then handed out a brief summary sheet of the 15 competition entries and went on to comment on each, having attached his personal observations to each individual story. He said that he had enjoyed all of the stories and found them to be of a uniformly high standard. Adjudication had thus been a difficult matter, but after several readings he found that the winning entry and the runner-up were clearly in his mind. He had more difficulty in choosing between two stories for third place, so declared them jointly successful. Susan then read her story in which various sources allow the reader to piece together the poignant history of an elderly man as he settles into a care home. Sheila expressed the Group’s warm thanks to Gary for an enjoyable and instructive adjudication.